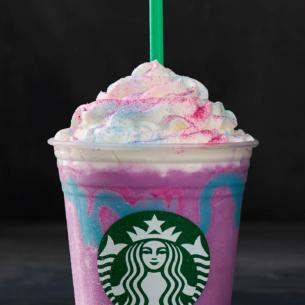 Here for a few days only: The flavor-changing, color-changing, totally not-made-up Unicorn Frappuccino. Magical flavors start off sweet and fruity transforming to pleasantly sour. Swirl it to reveal a color-changing spectacle of purple and pink. It's finished with whipped cream-sprinkled pink and blue fairy powders.